Sharing files from a Mac to a Mac is simple: You enable file-sharing in the Sharing preference pane and that's it. But trying to share files from a Mac to a PC requires a few more steps. And trying to access a PC's files from a Mac is more challenging still. Configuring your Mac to let Windows users access its folders isn’t all that different from doing so for other Mac users: You tell OS X which folders you want to be accessible, then set permissions for them. On Your Mac Start by opening the System Preferences Sharing pane. Click the lock icon at the lower left and enter your administrator password to unlock it (if necessary). Then select the File Sharing checkbox. With File Sharing still selected, click the Options button. Select the Share Files And Folders Using SMB (Windows) checkbox. In the list of users below that checkbox, put a checkmark next to the account you want to share. Enter that account’s password in the Authenticate dialog box and click OK. Repeat these steps for any other accounts you wish to share, then click Done. By default, OS X will share the Public folders for each user you just enabled. You can select other folders to share if you like: Click the plus-sign (+) button under the Shared Folders list and select the folder or drive you want to share. You can define access permissions for each shared folder in the Users section. If you’re the only user who will be sharing files between systems, you should already be on the list, with Read & Write privileges already selected. If you have multiple users on your network and you aren’t picky about who has access to your Mac’s files, select Everyone from the Users list and set permissions (Read & Write, Read Only, or Write Only [Dropbox]). To control access user by user, click the plus-sign (+) button at the bottom of the Users section and either select each person from your Address Book or click the New Person button and enter a name and password there. 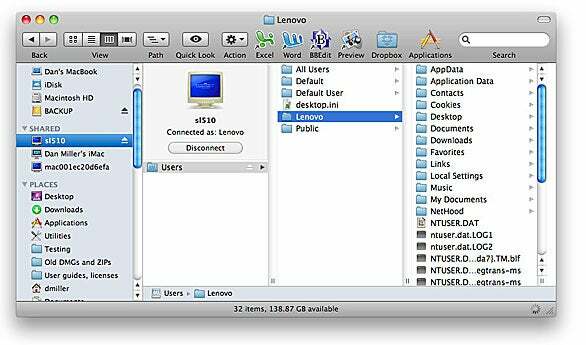 The Mac folders you’ve just shared should now be available from your Windows PC. Windows XP Click the Start menu and select My Network Places. If you don’t see the Mac listed under Local Network, click the Folders icon in the toolbar. In the Folders column on the left, look for the Mac under My Network Places. (It may be under Entire Network/Microsoft Windows Network/Workgroup.) Double-click the Mac entry and enter the username and password for the account you want to access. Sharing a Mac's files with a PC isn't that different from sharing them with another Mac: By default, your public folders are shared; you can share others by adjusting permissions in the Sharing preference pane. Windows 7 Click the Start menu and select Computer (or go to any Windows Explorer window.) In the sidebar, click the disclosure triangle next to Network. You should see your Mac’s name there. Click on it, and the shared folders will appear in the right-hand pane. The process of setting up a Windows PC to share its files with a Mac varies depending on which version of Windows you’re using. Windows XP If you haven’t set up file-sharing before, open the Start menu and select My Network Places. Click Set Up A Home Or Small Office Network in the left column. When the Network Setup Wizard appears, click through the screens until you get to the one for File Sharing And Printing. Select Turn On File And Printer Sharing, and click Next. Windows will then ask you to restart the PC to implement your changes. By default, the Shared Documents folder is available to other users on the network. To share another folder, right-click it in any Windows Explorer window and select Properties from the shortcut menu. Open the Share tab and select the options you want. Windows 7 If you haven’t done so already, create a password for the Administrator account: Go to Start menu and open the Control Panel in icon view. Click on User Accounts, then select Create A Password For Your Account, and follow the instructions there. If you haven’t previously set up Windows 7 for file sharing, open the Control Panel (in icon view) and select Network And Sharing Center. There, click Choose Homegroup and Sharing Options, then select Change Advanced Sharing Settings. In the subsequent window, turn on Network Discovery, File And Printer Sharing, Public Folder Sharing, and Password Protected Sharing. In the File Sharing Connections section, enable 128-bit encryption; in the HomeGroup section, keep the default setting. When you’re done, click Save Changes. 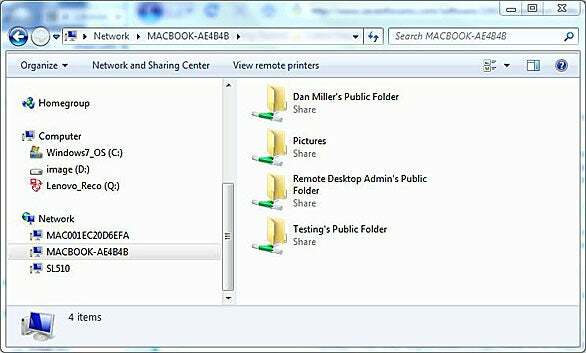 To share specific folders, go to any Windows Explorer window and right-click the folder you want to share. Click Share With and choose Specific people from the drop-down. In the File Sharing dialog box, select a user to share with (or create a new user) and set the level of access (Read or Read/Write). Sharing a Windows PC's files with Macs may not be as one-click simple as it is in OS X—but it's not that hard. On Your Mac Go to the Finder and click the disclosure triangle next to Shared in the sidebar. Click on the PC and enter the username and password for its Administrator account. You should then see the shared folders. If the PC doesn’t appear in the Mac’s sidebar, select Go -> Connect To Server (or press Command-K). In the Connect To Server dialog box, enter smb:// ipaddress or smb:// computername . (To find out the PC’s IP address or computer name, see “What’s My Name?”) If that doesn’t work, try adding the port number :139 to the end of the IP address (smb:// ipaddress :139). To share a PC’s resources with a Mac, you often need to know its computer name or IP address. Here’s how to find out both in Windows 7 and Windows XP. Windows XP Go to Start -> Control panel (Classic view), double-click Network Connections and then click the name of the active connection; you’ll find the IP address on the Support tab. For the computer name, go to Start -> My Computer, click View System Information, and then open the Computer Name tab. Windows 7 Go to the Control Panel (Category view), click View Network Status And Tasks in the Network And Internet section and then click the name of the active connection. In the Status dialog box, click Details; the IP address is next to IPv4 Address. To find the computer name, go to Start -> Computer. The computer name is at the lower left of the window next to the computer icon. John Rizzo is the publisher of MacWindows.com and the author of Snow Leopard Server for Dummies (Wiley, 2009).